She hinted she didn't want to ride. P gets stressed at the thought of homework building up, forms that need to be signed and bags that need packing for the next school day - which is a sad state to be in when you are 9 years old. I knew as soon as I saw her, as she wearily left the classroom, that she was unhappy; there were 50 multiplication sums and 10 spelling sentences to do for the next day. P can't think, or process, or have fun, until the pesky school work is completed. I persuaded her to trot around for 10 minutes on Spot who enjoys a little jolly. She rides well, little P, but I can see she doesn't always enjoy it. 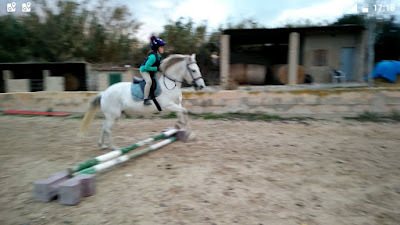 After a cajoled canter, I built a teeny, weeny, tiny jump. Go on I said. You can do it. And she did! Quite spectacularly. Twice in fact. She grinned, I praised her and hugged the pony for being so honest. She thought for a moment and considered her answer. "When you go over the jump it was like there was a big hammer, hammering down my homework into the jump!" Wow I replied. How does that make you feel? "Like an angel lived inside me" she said, flooring me with her reply. My 9 year old daughter had just explained how horses made me feel. No matter how life is turning out, how blue my day has been or desperately unhappy I felt; when I am near horses, it's like an angel lives inside me and nothing else matters. Rest in Peace Mr Fletcher, thank you for teaching me, for allowing me to feel, for your free spirit and wild ways. I will never, ever forget you. Run free you crazy ginger beastie and I'll see you on the other side for a mad gallop.